If you look at my social media profile pages, most of them say the same thing. There’s usually something weird like “My children were sent from the future to destroy me” and then it also says that I’m a Cookbook Author. 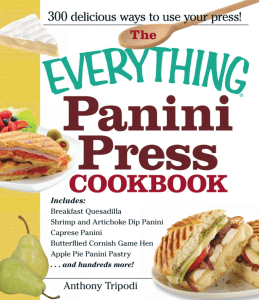 Back in 2011 I wrote The Everything Panini Press Cookbook . I recently took a look at this blog and realized that I never added a post about my cookbook. Worst author website ever! Well, better late than never. The story behind the book goes like this. I used to have another blog about panini sandwiches where I posted some cool recipes. You see, I’m a brown bagger and I have always brought my lunch to work. Eating regular sandwiches every single day was becoming boring and monotonous. Then I got a panini press as a gift and started experimenting with it. I’d take whatever was on hand, cold cuts, leftovers, take out and put it between some bread and press it. Some of these experiments were bad ideas that should have never been tried but a lot of them became some truly great lunches. And since I was already blogging about gardening, I thought I’d branch out and start a panini blog. An editor at Adams Media came across one of my blog posts about how you could use a panini press for a lot more than just making panini and she was impressed. I think the post was about using a panini press like an indoor grill for cooking hamburgers. This happened around the same time that the whole Julia and Julie thing happened. All of these bloggers were getting their own book deals and I was surprisingly one of those bloggers. The cookbook has over 300 recipes and I really enjoyed doing it. It would have been nicer to have another 3 months to write it but that crazy deadline is behind me now. Thank goodness for the panini blog. I already had over 100 recipes figured out. I also figured out a way to pack a panini sandwich in your brown bag lunch and keep them nice and crisp even if you only have a microwave for reheating in the office. That’s all in the book by the way. Anyway, if you’re interested in some good sandwiches, then I recommend that you check out my book. If you need to see my credentials, check my social media profiles. They say that I’m a cookbook author. Ignore the parts about my time traveling children. We love the panini book!